Set in the quirkily-named and suspiciously happy town of Wellington Wells, We Happy Few abounds with references to British culture and bursts at the seams with Monty Python references – and holds the keys to some of the most unique game design of 2018, providing stunning visuals alongside an intriguing plot that will keep you playing longer than you’d expect. A striking game that was announced way back in 2015 via Kickstarter campaign, there was a great deal of hype around Compulsion Games’ next title thanks to its innovative design elements and retro appeal. Now that We Happy Few has released after years of hard work, and some high-end AAA collaboration, does it live up to the excited fanbase it gained over those years? We Happy Few advertises itself as the ‘tale of a plucky bunch of moderately terrible people trying to escape from a lifetime of cheerful denial’, and sits firmly within the action-adventure genre, with equal focus on fight or flight depending on your play style – and a lot of chances for stealth options mixed in, too. Between the retro visuals, countless story-rich notes you can find lying around and the mission-based location-to-location method of plot continuation, there’s more than a touch of Bioshock around this game – so if you’re a fan of that series, it’s likely that you’ll like We Happy Few based on principle. 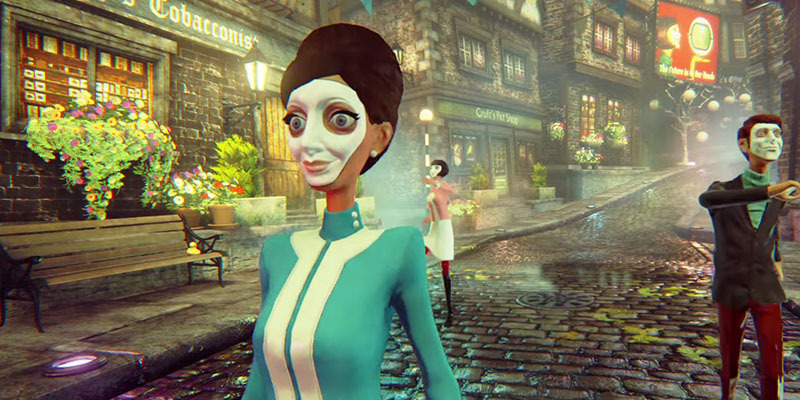 Without going too deep into spoiler territory, it’s clear from the off that We Happy Few is a highly story-driven game; an entirely different creature from the survival-based experience it was advertised as during its Kickstarter days; the evidence of which can be found on very early alpha builds from many popular Let’s Players. You begin the game as the hapless, and oh-so-British, Arthur Hastings, whose mannerisms and general lack of enthusiasm seem to be a close reference to another Arthur within the popular Hitchhiker’s Guide series. Upon seeing a story about his long-lost brother, Arthur is thrust into the world of the ‘downers’; those who are off the hallucinogenic and memory-repressing drug known as Joy that the world of Wellington Wells subsists upon to forget a dark and terrible secret. The game then presents you with a relatively open world to explore, along with the main plot and lots of juicy little side quests to get stuck in to on the way. Later on in the story, Arthur comes into contact with both Sally Boyle and Ollie Starkey, each playable characters later on in the game with their own playing style and storylines to follow. For the most part, though, Arthur acts as the main crux for the story, and the primary way to move the plot forward within this strange, retro world. The primary form of gameplay within Wellington Wells is of a more open-world variety, with a focus on travel and exploration across the map – allowing you to discover hidden memories, collect needed items and carry out required quests for a range of story-driven plots and stories. Some of these are small, quick tasks – helping a suitor to woo his chosen beau, for example, or winning a race – or more complicated, main story plots that require more significant detours and travel to new locations and islands, each of which come with their own quirks and complications. Part of the charm of these quests is that Arthur seems to know, or know of, everyone he comes across; a very British trait to introduce into the game that makes it feel all the more real. Gameplay takes place from a first-person perspective, with the traditional roster of menus and crafting items you’d expect from the action-adventure genre; allowing you to create healing balms and bandages, for example, or create stronger weapons and chemicals using workbenches or chemistry sets. This is where the first minor complaint into gameplay comes in, with your inventory often cluttered with far too many items that aren’t always that useful; though you are granted a high carrying capacity to cart those ten saucepans around with you if you so choose. It can sometimes be difficult to find what you’re looking for, or even know what’s useful from the beginning of the game, though the use of the storage system available in safe locations can mitigate this problem. Other than inventory efficiency, the bulk of We Happy Few’s gameplay can fall into three categories; blending in, stealth, and combat. In the more affluent areas of Wellington Wells, where Joy runs freely, even actions like jumping or jogging can prompt a hostile reaction from locals and Bobbies, so fitting in is a key part of standard gameplay; even if it means taking your Joy to get past checkpoints or into official buildings. As for stealth and combat, these are generally in reaction to failure in these situations, urging the need to hide in the nearest bush or sprint your way beyond a town’s limits. Though it’s possible to play the game with a Doom-like perspective of murdering everything in your path, it’s certainly not the recommended approach, and being chased by dozens of civilians will soon put you off the idea. Overall, We Happy Few is an appealing game. It’s amazing to look at, and you can certainly see all the care and love that has gone into the plot, as well as the design of every little element; from wallpaper to desk clocks, radio broadcasts to each clever pop culture reference. All of this makes the game a Joy (get it?) to play, especially if you look at it in terms of a form of art. One of the few things that let We Happy Few down is the procedurally generated elements of gameplay, which often feel unnecessary, especially in a game that is heavily story-driven. Because of this approach to game design, spaces between quests or events can often feel empty and devoid of life, and when you’re outside of a town or village space the appearance of these spaces don’t quite work; with miles of blank walls facing out into open fields and meadows. This, alongside the frequent bugs that occur within Wellington Wells – such as civilians leaning against a wall two feet off the ground, and Bobbies not being bothered about quest-based NPCs wandering around past curfew – are the only real things that break the immersion of the We Happy Few universe. In short, yes. The charming 1960s novelty and unique style of the game goes a long way towards turning what is a frequently used video game trope into something new and interesting. You’re itching to find out what’s around the next corner, and certain sections of the game will certainly have you at the very least smiling at all the silly references and ridiculous situations Arthur finds himself in or blusters his way out of. If you’re a lover of high-octane, combat-based gameplay, then We Happy Few might not be for you. But if you’re a fan of retro style, excellent visual design and amusing pop culture references in an action-adventure setting, then this game should be the next purchase on your list. Excellent visual design inspired by 1960s nostalgia and British pop culture that makes each and every location exciting to explore. Intriguing and original storylines lending heavily from dystopian fiction. Clever and funny narration that makes you want to keep on playing just to experience what someone will say next. Bugs, bugs, bugs - some of which shouldn’t have made it to release, such as floating NPCs and clipping issues in many locations. Unnecessary inclusion of procedurally generated elements, that extend gameplay without adding anything new. A slightly cluttered and confusing inventory system that could have been improved upon.